Prioritizing and assigning CRM cases to agents in order to make sure they're handled within service level. Custom rules can vary assignment based on time spent in queue and case content. Distributing leads to sales teams. TaskRouter's business rules provide control over prioritization so that teams are always working on the most important opportunity. Want to get started quickly? Dive into the TaskRouter QuickStart. Each step taken by TaskRouter emits Events which log all activity within the Workspace. These events can be used for reporting, or applications can subscribe to the events and trigger new actions. In addition, applications can listen to Event Callbacks. These JSON web requests cover a wider range of events, and they can be used by back-end services to track information across an entire Workspace. These callbacks can be useful to generate realtime reporting dashboards by aggregating event information, like worker.activity.update and task.completed events. TaskRouter is a powerful tool when combined with other Twilio products. For Tasks that represent voice calls, TaskRouter can tie the lifecycle of a call to the lifecycle of a Task. This is particularly useful for automatically adding the assigned Worker as a participant in a Conference with an inbound caller. Queueing Twilio Calls provides more detail on how to setup these integrations. A TaskRouter Workspace is multitasking by default. A Worker's capacity (defined by their WorkerChannels) determines if they can handle three simultaneous chats, a voice call and a chat, or only one voice call. Setup: Create Workers with the appropriate attributes, a TaskQueue associated with the Workers, and a Workflow to control Task assignment and escalation rules. Create a new Task. The Task will sit in queue until a matching Worker is available. 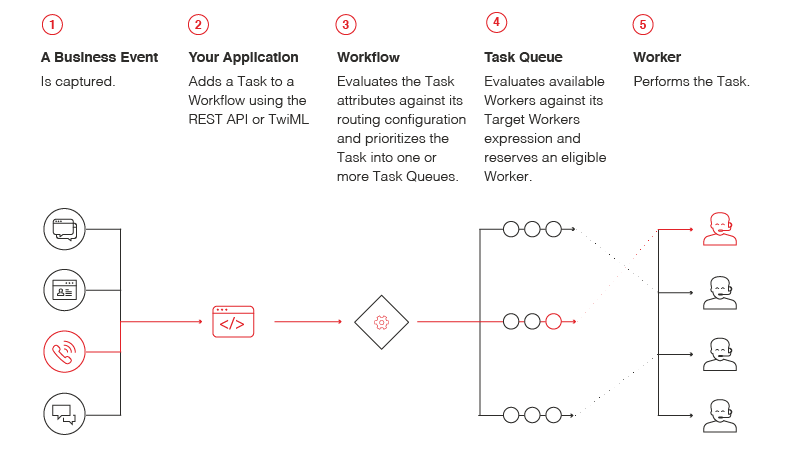 TaskRouter identifies the available Worker and creates a Reservation pairing the Worker with the Task. The Worker's capacity is taken by the pending Reservation. TaskRouter emits a reservation.created event to the JS SDK and as an Event Callback. Respond to the JS event to accept the Reservation. If the Task was a voice call created through <Enqueue>, accept with a conference instruction to automatically bridge the Worker into a Conference with the inbound caller. Complete the Task from the JS SDK once the Worker is finished. The Worker's capacity is released. The process repeats as new Tasks are created. Update the Worker to Offline to end their shift. Learn more about the lifecycle of a Task, using Workflows to manage assignment, or blueprints for designing a contact center. Use the REST API to create TaskRouter resources and learn about each entity.